City of West Hollywood flyer promoting Crenshaw Line Extension. The campaign to secure an extension of the Metro rail line through West Hollywood got a major boost yesterday with Metro agreeing to take the steps necessary to start working on plans that would allow work on a northern extension of the Crenshaw/LAX line as early as 2020. In a letter to City Councilmember Lindsey Horvath, Phil Washington, CEO of the L.A. County Metropolitan Transportation Authority, outlined several steps Metro is taking to make the Crenshaw/LAX northern extension “shovel ready” should county voters approve Measure M. Measure M is a proposition on the November ballot that would permanently increase the countywide sales tax from 9% to 9.5%. It is projected to raise $860 million a year, with $1.9 billion spent on regional rail and $29.9 billion spent on bus and rail operations. Horvath and Councilmember John Heilman are on a Council subcommittee working on the Metro project. The steps Washington mentioned include completing a feasibility study that is currently underway by June 2017, proceeding with a study of alternative routes for the northern extension in 2017 and developing an environmental impact report on the preferred route in 2018. 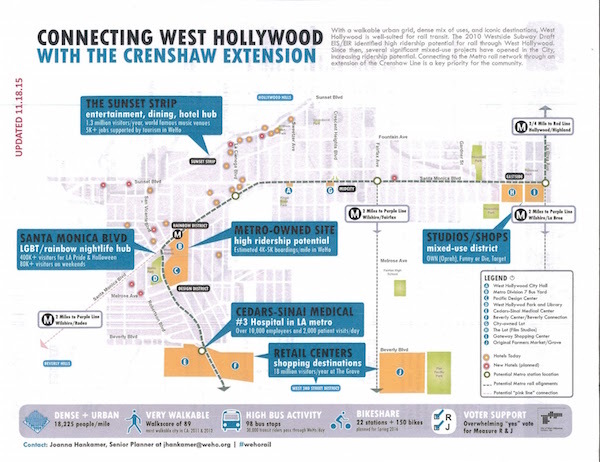 The extension would connect the Crenshaw/LAX line with the Hollywood/Highland Red Line station in Hollywood. The northern extension has been part of Metro’s plan for use of proceeds from the Measure M tax increase. However construction of that project had been forecast to begin some time from 2041 to 2047, with other Westside projects such as a tunnel through the Sepulveda Pass and completion of the Purple Line subway to the VA West Los Angeles Medical Center projected to begin earlier. It is not certain that Metro ultimately will agree to route the northern extension through West Hollywood. Metro’s original budget for the extension assumed it would run from San Vicente and then along La Brea Avenue on WeHo’s eastern border to the Hollywood/Highland Red Line station, for a total of six miles. But Fehr & Peers, a consultant hired by the city, presented data to argue that running the extension from San Vicente to Santa Monica Boulevard for nine miles will better benefit West Hollywood and Metro by increasing ridership by more than 300%. Other options considered by Metro are running the extension from San Vicente to Fairfax Avenue and on to the Hollywood/Highland Red Line station and ending the extension at the Wilshire/Vermont Red Line station. However, Horvath said she believes West Hollywood will have an impact on Metro’s ultimate decision. “West Hollywood will have a strong voice in determining the preferred alignment, along with the All on Board Coalition and other community stakeholders, during the county process which is now slated to begin mid-2017,” she said, referring to a coalition backed by the city that is lobbying for the extension through West Hollywood. What we really need is a heavy rail extension spur (not light rail) from the current Hollywood/Highland Red Line station to the new La Cienega/Wilshire Purple Line station. Metro can run the Crenshaw line up through La Brea too. That area is dense enough to support its own mass transit line. Let’s not be cheap y’all. Let’s build it like you know it should be built! Was there any discussion on exactly how the rail line would be built along Santa Monica Bl? A subway would run faster than a surface line, but cost much more and take much longer to build. Our voices collectively can be used to repeal “The Acti of 1998” which barres props A/C money from being used on subway. There is plenty of money for Metro to reactivate the heavy rail Pink line extension AND have the Crenshaw light rail go up either La Brea or Fairfax without this one line compromise on the table. “Creative One,” I understand what you are saying now. However, it would also be a trade-off for the Cedars-Sinai area, and would ignore anything west of Fairfax. San Vicente/SMB is the center of gay nightlife in West Hollywood, and having a subway stop there would hopefully reduce the number of drunk drivers on the road, and also save people a lot on parking. During the day, residents can use it for commuting. I don’t think anyone west of Fairfax is going to complain about additional travel time to H&H or LAX when they now have subway access, and this would hopefully reduce traffic, as most of the city (which has a huge population density) would be connected to a network to get them downtown, and elsewhere. Well over half over the city’s residents live west of Fairfax. It should be no surprise that a lobbying group for the City of West Hollywood is going to advocate for as many stops through West Hollywood as possible, from the west side to the east side. What guarantees do we have if we vote in a local sales tax? They promised us a train in 2008. They promised an LAX connector in 2008. What makes you so sure they’ll deliver this time? I mainly point out Fairfax as the compromise route that still benefits West Hwd. The least expensive way (and more direct) route would be the initial La Brea alignment. San Vicente adds (1) considerable cost increase (2) additional travel time from H& H to LAX (3) likely backlash from Carthay Circle residents to at-grade rail through low density neighborhood. Yes, Cedars/Bev Center and boystown deserve better mass transit, but not sure a realignment of this route along SV is the best for system as whole. Manuel, Metro already has a red line going into the valley. It is extremely unlikely they’d have two subway lines and dig a second tunnel, or widen an existing one. Not to mention building an entirely new station at the Hollywood Bowl, which is dark six months out of the year. I believe the only thing they will consider is a connection at Hollywood and Highland, and that makes the most sense. As far as connecting to further valley destinations, they’d probably just extend the existing red line, if that were to ever happen. The line should end at the Hollywood Bowl not HH with the possibility of extending it north to the Valley and the Burbank airport via Hollywood Way with stops at East Universal studios, WB studios, Hollywood way/Chandler, Burbank airport and finalize at Hollywood Way and San Fernando at the future Metrolink/CAHSR Station. First, is there a PDF of the map, it is quite small. Second the two lines are completely different, the Crenshaw line will be like the Expo line (Light Rail), Red & Purple lines are Heavy Rail. Metro could block off Hollywood blvd. from La Brea to Highland and have a three track station like DTSM. Other than that it’s impossible. From Wiki: Metro Rail maintains two distinct systems of rail: a light rail system and a heavy rail system. The heavy rail and light rail systems are incompatible with each other, even though they both use 4 ft 8 1⁄2 in (1,435 mm) standard gauge. Metro’s heavy rail lines are powered by third rail, whereas its light rail lines are powered by overhead catenary. Also, the two separate systems have different loading gauge, and platforms are designed to match the separate car widths. I can’t even believe people are complaining about this. Yes, it will reduce gridlock, if it ever gets built and connected to the larger network. Think about the number of places you could get to with out a car? Hollywood, downtown, Santa Monica and even LAX. Yes, it could take longer, but that is mostly because of how much urban sprawl we have. “fine7760,” that will never, ever happen. They chose Wilshire as their corridor out to the beach and (for now) only have funding to get them to Westwood. It wouldn’t make sense to build a second rail down SMB, when Wilshire and SMB run parallel to each other (after they cross paths in Beverly Hills). And, yes, “Creative One,” Fairfax runs through WeHo. Only from Willoughby to Sunset (I live near Willoughby and Fairfax). This proposal calls for a stop at Fairfax and SMB, but also includes the west side of the city, as well as Cedars-Sinai and the Beverly Center area. It makes total sense to me. It addresses most major intersections along SMB. I think its great this section of the subway system could be completed EARLIER. Lets stop complaining and rally behind them to get this done. I think its a bit high expectations that the route is not going to go the cheapest way (via Fairfax or La Brea). But we should push as much as we can for that west reaching option and down SM Blvd. If we dont get that option…I think we should still push for some type of elevated light rain from H&H to Beverly Hills (the so-called Pink Line) or other subway connectors. It’s not intended to reduce gridlock. It’s intended to provide an alternate mode of transportation for residents and visitors. Nothing short of road pricing or quotas will reduce road congestion. It’s been proven that rail lines only give an alternative, it doesn’t remove cars. Read about triple convergence theory. If you want to do something about road congestion and pollution, talk to your elected officials about congestion pricing your roads. That extension will do little in reducing the grid lock on Santa Monica Bl. What is truely needed is a light rail line along Santa Monica Bl. from at least Centenilla all the way to downtown L.A..
Let the vote pandering begin. Remember folks, Fairfax runs through part of West Hollywood. It seems our elected officials often forget that.